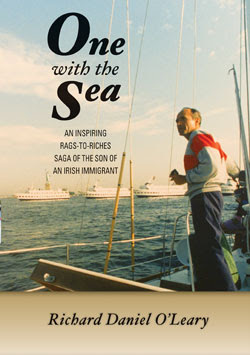 In One With the Sea (Jetty House), much is made of author Richard Daniel O’Leary’s affinity and passion for the sea. But it’s more than that that pushes the young man back to become head of a large shipping and cruise company. What started as a one-man operation grow s to be a national company. By the time O’Leary retired in 2005 after 34 years as head of Cruise International, he was responsible for more than 2500 employees operating out of ten ports. Though there is a sense of great deeds just below the surface in much of One With the Sea, it never moves very far beyond the realm of family memoir. The wife, the daughters, the poodles take up many of the pages, and that’s fine. O’Leary comes across as warm and loving, and that’s pleasant, as we spend a lot of time with him. But, for the most part, the book meanders rudderlessly. One is sure the book is accurate and that all the necessary facts are there, but it’s never anywhere as interesting as it could be and you get the feeling that, just below the surface, great stories are waiting to be told.